What luck to be in Houston while Dance Salad Festival is in progress! Yes, Houston, Texas; you thought it was all about the Bar-B-Que, but it is now about the Salad. The Hedgehogs attended the concert March 25, at the Cullen Theater of Houston’s Wortham Theater Center. Seven dance companies from five different countries presented work in the Festival, including three US premieres and three Houston premieres. While each dance was different from the others, they had one great element in common: fantastic dancers. Strong, supple, able to leap tall buildings in a single bound, these are dancers who are rightfully described as fearless. Trained in classical ballet and a variety of modern techniques, they provided their choreographers endless possibilities for movement. The program was so captivating that we returned on March 26; there will be a Part II of this Post. Founder, producer, and director Nancy Henderek appears to have discovered elements to keep her audience involved, surprised, and even entertained by dance that is serious and occasionally amusing. Nicolo Fonte, choreographer of Beasts for BalletX, of Philadelphia, is a native New Yorker, studied at the Joffrey, San Francisco, and New York City Ballet Schools, received his BFA in Dance at SUNY, Purchase, and danced with Les Grands Ballets Canadiens, Montreal, and Compania Nacional de Danza, Madrid, until devoting himself to choreography. The two parts of his work, Beasts, shown March 25 were thought provoking. 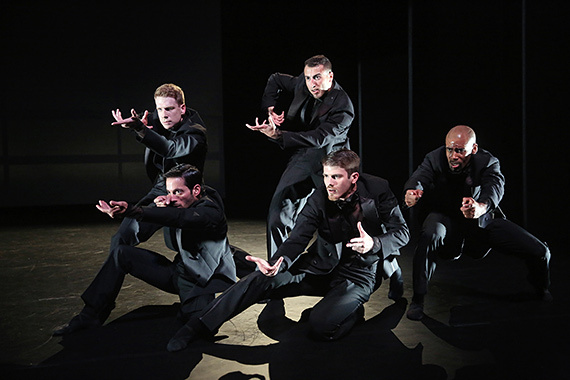 Men’s Section begins with movements much like those of Kurt Joos’s great, Expressionist ballet, The Green Table, brought back to life by the Joffrey Ballet. Men dressed in black dress suits alternate between polite and threatening gestures. However reminiscent of Joos it may be, the dance proceeds in its own way. The dancers’ interactions include specific movements suggesting shooting rifles and four of them lining up while the fifth aims his hand like a gun to execute one. Fonte’s ensemble movements are eye opening. The men are powerful, graceful, dynamic, and, in this dance, doomed. The choreographer builds the tension with the unfolding of individuals out of a group and recovering into another group. 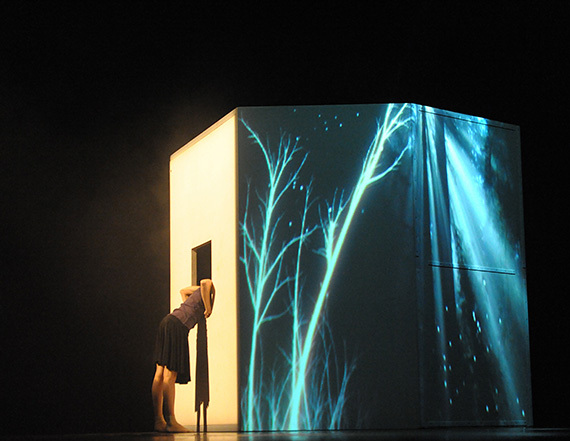 It is an anxiety provoking dance resolving into sadness. Men’s Section was followed by Mata Hari section. Women are introduced into the dance; it’s all trouble from the time they enter. One Hedgehog commented that apparently females are scarier than rifles. Costumed in elegant, floor length gowns and pointe shoes, the dance seems to call out “Danger!” Mata Hari is depicted by Chloe Felesina; her prime victim is Daniel Mayo. Mata Hari in this dance embodies attraction too enticing to turn away from although betrayal is assured. Pictures: Men’s Section Photo: Bill Hebert, Mata Hari Section; Photo: Alexander Iziliaev. When a ballerina comes down the aisle dressed in classical tutu gear, wearing glasses and carrying a handbag, the audience knows that Le Grand Pas de Deux will be something completely different. Choreographed by Christian Spuck and performed by Alicia Amatriain and Jason Reilly, it is set to the comical music of the Overture from The Thieving Magpie by Rossini. Ms Amatrian is originally from Spain; Mr. Reilly is Canadian; both are greatly acclaimed dancers with Germany’s Stuttgart Ballet. They performed the spoof of a classical pas de deux with finesse, avoiding too much heavy slap stick, even when Ms Amatriain goes skidding across the floor on her stomach or tries to do her turns and balances with the handbag briefly in her mouth. Choreographer Spuck allows them to show they can do the real thing: she whips around in multiple fouettes; he turns with one leg in second position, lifted straight out from his hip and held there as he turns repeatedly. They added a touch of glamour and welcome humor to a night exploring the possibilities of dance. At top photo:Fall: Filip Van Roe Watch the Livelyblog for Dance Salad, Part II. It will include Yidam, by Ihsan Rustem, NW Dance Project; Black Swan Section, by Nicolo Fonte, BalletX; Faun, by Sidi Larbi Cherkaoui, Royal Ballet of Flanders; L’verno/Winter, by Mauro Astolfi, Spellbound Contemporary Ballet. AND, AESTHETIC OBSERVATIONS: What’s Happening in Dance? This entry was posted in Hedgehog Highlights and tagged Ballet of Staatstheater am Gartnerplatz Munich Germany, Ballet X Philadelphia PA, Chloe Felesina, Christian Spuck, Dance Salad, Daniel Mayo, Houston, Jacopo Godani, Luis Martin Oya, Marguerite Donlon, Mauro Astolfi, Nancy Henderek, National Ballet of Canada Toronto, Nicolo Fonte, NWDance Project Portland OR, Piotr Stanczyk, Royal Ballet of Flanders Belgium, Sidi Laribi Cherkaoui, Sonia Rodriguez, Spellbound Contemporary Ballet Rome, Stuttgart Ballet Stuttgart Germany on March 27, 2016 by Leslie.